Where did Netflix go on my Tivo? What gives? Where did Netflix go and why did it disappear from where I was used to accessing it? I never found out the answer, but the solution to the problem is quite easy, as long as you have a Tivo Roamio, HD, Series3 or Tivo Mini that supports Netflix on your machine. You can get to your Netflix Instant Queue from Now Playing in a few easy steps. Once you’ve gone through thee steps, it’s a waiting game. 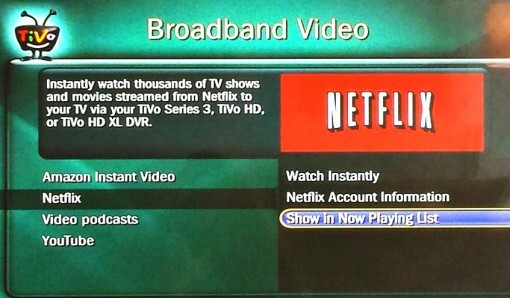 The next time your Tivo makes connects to the internet, the Netflix option should appear in your Now Playing menu. While you wait for Tivo to connect, you can still access Netflix via the “Video On Demand” option and choose “Watch Instantly” – that will take you to the Netflix menu and Instant Queue. *You can also try manually updating/restarting your Tivo machine to see if that helps out. TiVo’s Not-So-Lifetime Service: Where do TiVos go to die? How can I watch HBO GO on Tivo?